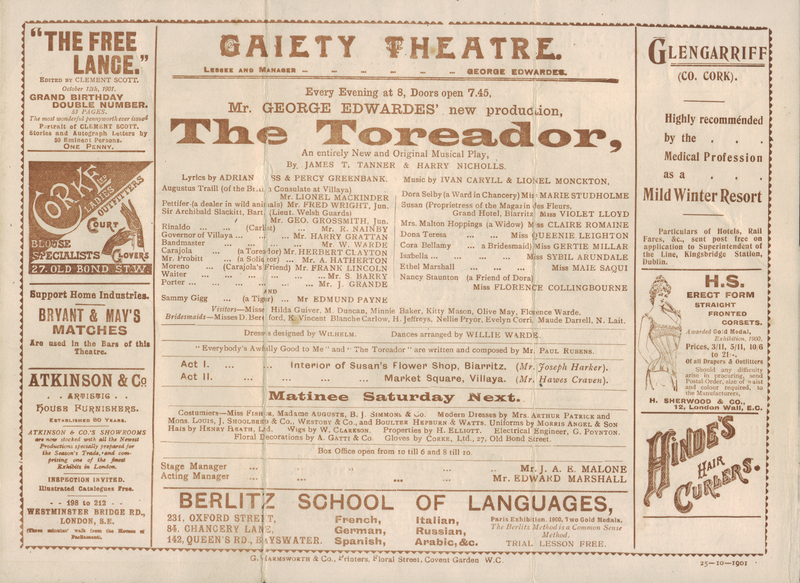 Mr. George Edwardes’ original London Gaiety Company in “The Toreador,” is the attraction at the Dublin Gaiety Theatre during this week. The entire production has been transferred direct from London, including scenery, dresses, effects, etc. Mr. Edwardes has gone to enormous expense in carrying out this engagement. 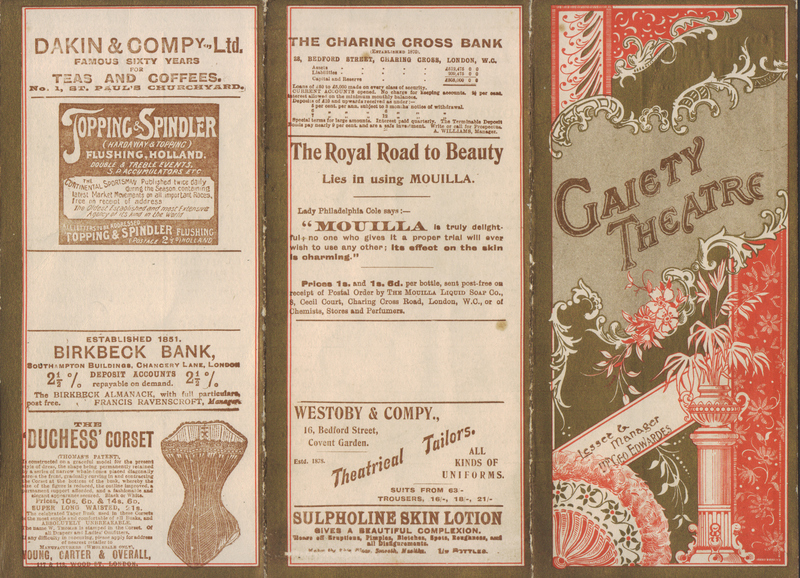 “The Toreador” finished its successful career on July 4th, and with it the “Old Gaiety.” The London Gaiety was opened by Mr. John Hollingshead on December 21st 1868, with a triple bill, made up of the operetta, “The Two Harlequins,” Alfred Thompson’s adaptation of “L’Escamoteur,” “On the Cards,” and W. S. Gilbert’s operatic extravaganza, “Robert the Devil.” But three decades and a half have passed, and we already come to the final performance within a theatre whose varied policy and productions have been as much discussed as those of any playhouse in London. For the last night of the “Old Gaiety” Mr. Edwards received over 20,000 applications for seats in the Pit and Gallery alone. Nearly every actor and actress of note has appeared et the London Gaiety at some time or other. 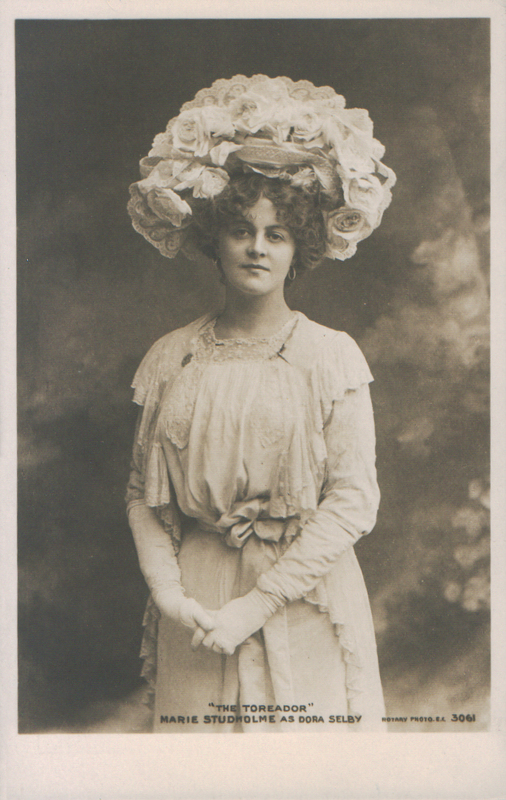 Ada Cavendish, Samuel Phelps, Charles Matthews, John Ryder, George Conquest, Arthur Ceril, Sims Reeves, all appeared at the Gaiety in those early Hollingshead days. A good deal further down the fatal roll come the names of Fred Leslie, Kate Vaughan, E. J. Tounen, W. Elton, David James, Erneanx Cook, Tillie Belmore, Charles Harris, Meyer Lutz. 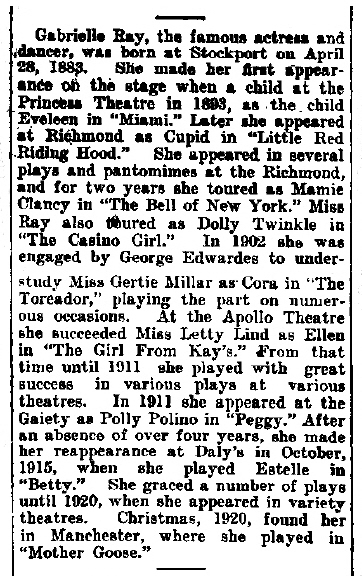 In addition to “The Toreador” will be played “The Linkman,” or Gaiety Memories, which is a review of past Gaiety successes. All the most popular songs are introduced, and the old favourites impersonated by present-day artistes. The company include Mr. Fred Wright, jun; Mr. Lionel Markinder, Mr. George Grosmith, jun; Mr. Robert Vainby, Mr. Harry Grattan, Mr. Herbert Clayton, Mr. Arthur Hatherton, and Mr. Edmund Payne. Amongst the ladies are Miss Connie Ediss, Miss Violet Lloyd, Miss Florence Allen, Miss Hilda Jacobsen, Miss Adrienne Augarde, Miss Gabrielle Ray. A remarkably handsome souvenir will be given away on Friday night. The production is in the capable hands of Mr. A. E. Dodson. The orchestra has been specially augmented, and will be under the direction of Mr. Jacques Greebe. So great is the affection which the old Gaiety Theatre has won from the hearts of London playgoers that it may well be surmised that sentiment has had as much to say to the enormous demand for seats on July 4th as the desire for amusement. That Mr. George Edwardes evidently realise this can be seen from the programme which he has prepared. 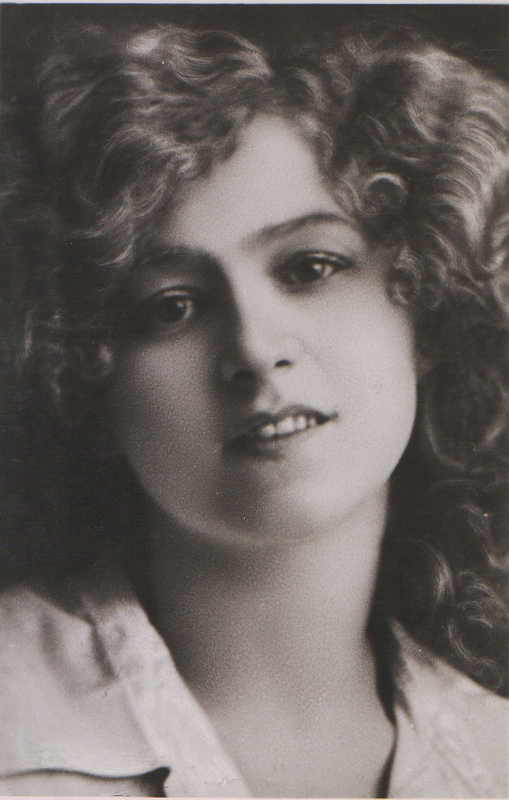 In addition the second act of “The Toreador” and “The Linkman,” which will cater for the one feeling, a farewell speech is to be delivered Sir Henry Irving, and “Auld Lang Syne” is to be sung by Miss Florence St. John, the chorus being taken all old Gaiety favourites past and present, who will assemble together on the stage for the last time. And no doubt Mr. George Edwardes will be neither surprised nor annoyed find the whole audience rise in their places and join in a last goodbye to the stage which has served them so well. The present GAIETY THEATRE, being now in the last few months of its existence, it has occurred to Mr .GEORGE EDWARDES that the patrons of the house may be not unwilling to be reminded of some of the brilliant success of the past. He therefore, offers the public an opportunity of renewing acquaintances with a selection of the moat popular scenes, characters and songs that have enlivened the Gaiety boards from the days of Mr. JOHN HOLLINGSHEAD’S Management down to the present time. These will be embodied in a short Sketch, entitled THE LINKMAN or GAIETY MEMORIES, and will be introduced into Act 11 of THE TOREADOR, on and after TO-MORROW (Saturday) EVENING.